Virginia and Texas Tech will vie for the right to be this year's champions after victories in the Final Four on Saturday. Virginia got three late free throws from Kyle Guy after he was fouled on the final play to get past Auburn. Texas Tech slowed the pace and suffocated Michigan State's typically fast-paced offense. Now, one school will be crowned national champions for the first time ever. It's the first time we get two teams without prior championship game experience since Magic Johnson and Michigan State squared off against Larry Bird and Indiana State in 1979. Check out the schedule and tip time for Monday's national championship game along with info on how to watch it and who will be on the call. As always, fans can also watch the tourney live online via March Madness Live. Who wins Texas Tech vs. Virginia, and which side of the spread hits over 50 percent of the time? 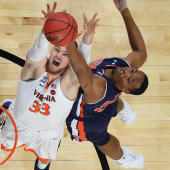 Visit SportsLine now to see which side of the Texas Tech vs. Virginia spread you should be all over, all from the model that has crushed its college basketball picks, and find out.